Have I said somewhere else how much I love the Donna Hay style? 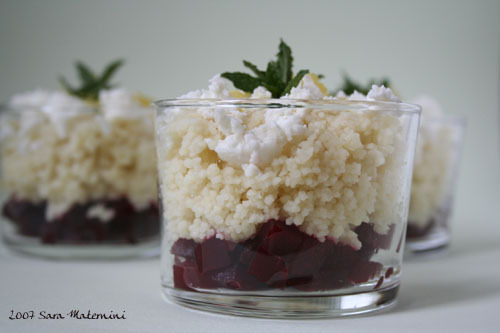 Like this combination of three basic ingredients: couscous, feta and beetroot. Together they make your mouth (and your soul) very happy and satisfied, a feeling that you would never imagine from something so simple… The best way to taste it is with the couscous still warm and dressed just with a drizzle of olive oil and lemon juice. Mint was for decoration, but wasn’t bad at all! These flavors sound great and those photos make it look great.